There are a lot of atheism resources on this site for beginners: what atheism is, what it isn't, and refutations of many popular myths about atheism. Atheism is the Absence of Belief in Gods: The broad, simple definition of atheism is simply the absence of belief in gods; atheism is not the absence of beliefs generally. Normally called "weak atheism," this definition is attested to in most comprehensive, unabridged dictionaries, and specialized references. Disbelief in gods is not the not the same as a belief or as the denial of gods. The lack of a belief isn't the same as having a belief and not believing something is true isn't the same as believing it is not true. This broad definition of atheism was used by early freethinkers and continues to be used by most contemporary atheist writers. It is also the definition of atheism used consistently throughout this site. Atheists use this broad definition not simply because it's what we find in dictionaries, but because the broad definition is superior. The broad definition helps describe a broader range of possible positions among both atheists and theists. It also underscores the fact that theists are the one making an initial claim. The narrow definition of atheism as denying the existence of gods or asserting that no gods exist is really only relevant in specialized contexts, like philosophical literature. What it Takes to Be an Atheist: Not much — no faith, no commitments, no declarations. An atheist does need to be godless, though godlessness isn't quite the same as atheism. Not everyone recognizes that there are significant differences among atheists, not just in questions about religion and theism but also in political philosophies and all major political issues. Why Don't Atheists Believe in God? There are lots of reasons why an atheist might not believe in any gods. There is no one reason for atheism and no one path to atheism. Broadly speaking, though, atheists just don't see any reason to bother believing in any gods. Atheism is Not a Religion or Ideology: You can tell when people are getting this wrong because they incorrectly capitalize atheism and atheist in the middle of sentences as if it were a proper noun like Christianity or Muslim. It's not! Atheism isn't any sort of belief, which means that it can't be a belief system, which in turn means it can't possibly be a religion on its own. Atheism is Not an Absence of Religion: Some atheists make the opposite mistake, thinking that atheism is an absence of religion. As noted above, atheism is simply the absence of gods, not an absence of religion. Atheists can be religious and there are atheistic religions. This is because theism isn't the same as religion. Atheism and Agnosticism are Not Mutually Exclusive: Many if not most atheists you encounter will also be agnostics; so are some theists. Atheism and agnosticism are about related by separate issues: belief and knowledge (specifically, the lack thereof). Disbelief in Gods Isn't Another Belief: Many people have the mistaken idea that disbelief in gods is still just another belief. This misconception can be eliminated through a better understanding of the basic terms of debate: belief, knowledge, disbelief, faith, and denial. Atheism is Not the Same as Communism: You can support communist or socialist politics while being a theist and you can be an atheist who is staunchly opposed to anything and everything even remotely socialistic, never mind communist. Atheism is Not the Same as Nihilism or Cynicism: Atheists can hold many different philosophies (including nihilism) or attitudes (like cynicism) but they aren't required to hold either of those. Atheism is Not a Choice or Act of Will: Christianity requires that beliefs be choices in order to treat disbelief as a sin and as deserving punishment, but voluntarism of beliefs makes little sense. It's more reasonable to view beliefs as forced conclusions from the evidence before us. Atheism is Not the Cause of Millions of Deaths: The extreme death and destruction caused by theistic religion have led some believers to try to argue that atheism is worse, but while some atheistic philosophies can inspire violence, atheism itself has never done so. 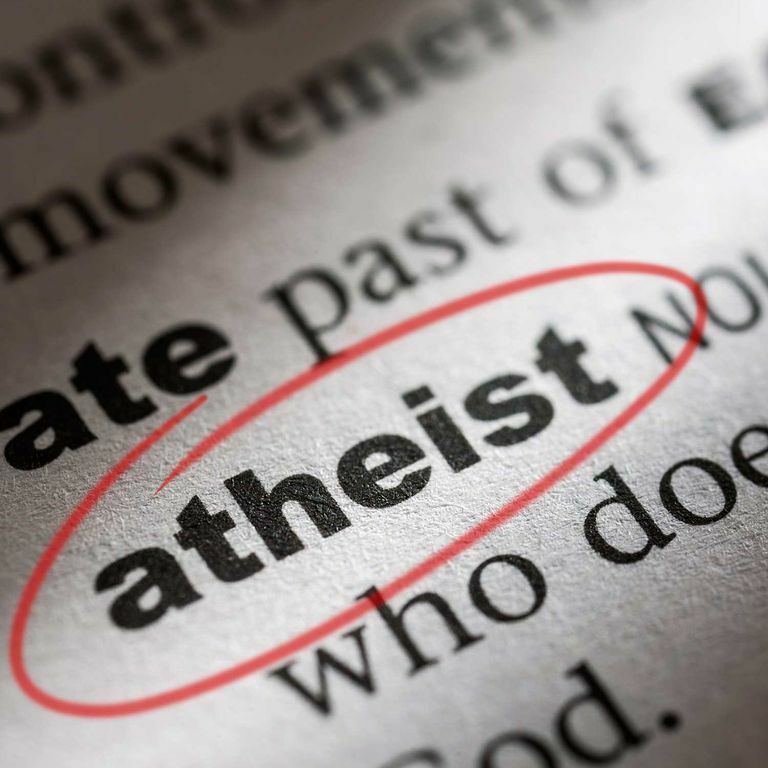 There Are Atheists in Foxholes: Not only is it false that life-threatening experiences magically transform atheists into theists, it's easy to find examples of where such experiences cause theists to become atheists. Atheism Does Not Require Faith: You don't need any sort of "faith" to disbelieve in gods, just as you don't need faith to disbelieve in elves or Darth Vader. Atheism is Not Incompatible with Morality: There is nothing about morality and ethics which requires the existence of or belief in gods. Secular atheists have no more trouble behaving morally than do religious theists. Atheists Can Have Meaningful, Loving Lives: No matter how important belief in a god or following a religion may be to believers, secular atheists have no problem living good, meaningful lives without any of that. More Myths About Atheism: There are far too many myths, misconceptions, and outright falsehoods about atheists and atheism to list on one page. What Is the Definition of Weak Atheism?